There is a misperception that if a parent receives services they will feel complete. On the contrary, it is when a person gives or is of service to others that there is a sense of accomplishment, confidence builds, and a feeling of self-worth. Engaged families are more than passive participants or consumers. Engaged families may be anything but compliant. Engaged families are empowered families and know that what they offer and receive is important and makes a difference. This spirit of reciprocity brings a different level of energy and acknowledges parents and staff as equal partners in improving services for families. 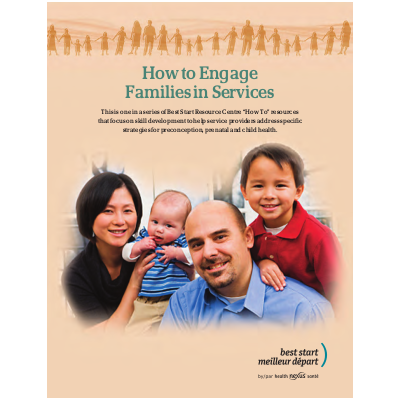 This resource shares information about how service providers can engage families in services including ideas, tips, examples and programing ideas. It provides key information about parent engagement, determining the needs of parents, responding to parent needs, promoting services to parents and retaining parents in services. The resource is designed for service providers who work with parents and/or children, for example organizations offering parenting programs or childcare services.